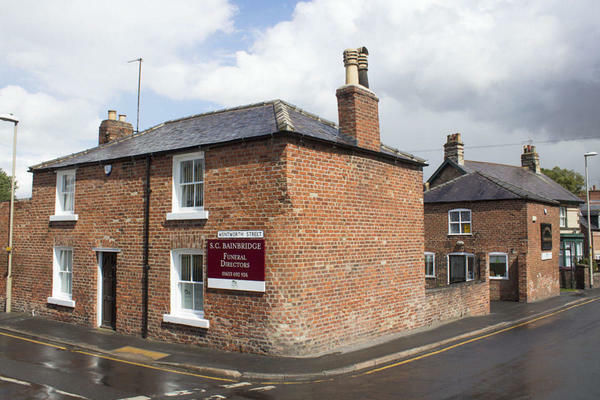 At S C Bainbridge Funeral Directors we are dedicated to providing the highest standards of funeral care, services and facilities. We are here to help every family in our cherished local community of Malton, whenever we are needed, often attending charity events and offering support where ever it is needed. When you visit us, our dedicated staff will take the time to understand your requests so that we can plan a funeral service befitting your loved one. Our funeral home has two comfortable chapels of rest, which you are free to use to spend time alone with your loved one in the time leading up to the funeral. We also have disabled access throughout. We are always here to support you, doing everything we can to make a difficult time a little bit easier for you and your family. You can get in touch with us by telephone 24 hours a day. We are here to help you. Our Simple funeral is available for £1,825 + third party costs, without compromising on the quality of the service that is delivered. Or our Full Service funeral can be tailored just how you wish, whether that be a traditional ceremony or a colourful celebration of life. Call us today on 01653 692926 to talk through your personal requirements. At S C Bainbridge Funeral Directors, we understand how special life is with those that you love. For us, every funeral is unique and personal. We have a service to fulfil every wish, with every detail carried out with the same uncompromising quality of care. From a traditional service, to a colourful woodland burial, your options are limitless with our Full Service Funeral. If you have a little more flexibility when it comes to arrangements, then we can provide a Simple Funeral for a lower cost. There is a dedicated car park available, turn left past the funeral home. We are near J.B. Motors of Malton. Our staff are available 24 hours a day on 01653 692926 if you require our services outside of these hours. Staff were courteous, attentive to our needs, and helpful without being intrusive. The funeral itself went without a hitch and we felt it was well organised. Thank you for taking the time to share your thoughts with us. I am pleased that you were so well looked after by our team. All the staff were extremely helpful and soon got back to us if we had any queries. We felt that they delivered a very good service and that dad was in good hands. Thank you for taking the time to complete the online review. I am pleased that you were so well looked after by our team and that the arrangements for your Father were carried out to your satisfaction. At a very difficult and emotional time concerning the death of our father the family were assured in knowing we had a funeral plan in place with Dignity Funerals, and chose S. C. Bainbrige Funeral Directors to represent us. From the initial phone call informing them of our bereavement they worked tirelessly on our behalf. The team led us through the formalities needed for the funeral to go ahead and were always on hand to give guidance. They were frequently in contact which was very reassuring. When it came to planning the actual funeral ceremony they again led us through, step by step so that nothing was left undone and nothing was left to chance. Mark and the entire staff treated the whole family with care and sensitivity. They were extremely professional at all times. They took the weight from our shoulders. Care didn’t stop after the funeral. The team have been very helpful by maintaining contact and making us aware of the legal service offered as part of the Dignity package. They made a difficult time so much easier. I would highly recommend S.C. Bainbridge and Dignity Funeral plans. Thank you for sharing your experience with us on your online review. I am pleased that we were able to look after you and your family at this difficult time and that that the arrangements for your Father were carried out to your satisfaction.